We’re revisiting the KonMari method and decluttering our home! This week, we tackled our clothing – let’s chat about decluttering your clothes and how Marie Kondo says to fold them! Last week, when I shared that we are planning on decluttering our home using the KonMari method, I wasn’t sure if many of you would be interested in joining me. But, I have to say, the response has been overwhelming in the best way! I’ve gotten so many messages from those of you who are eager to dive in – some of you have already started thanks to the push from Netflix’s show, and some of you started with me last time I did this and never quite finished. Regardless of why you’re joining in, I am so thrilled that so many of us are in this together and committing to holding each other accountable to get it done. Maybe it’s the fact that we live in a home that’s so much smaller than the last time I did this, but I’m more motivated than ever to really purge my home of the excess clutter. 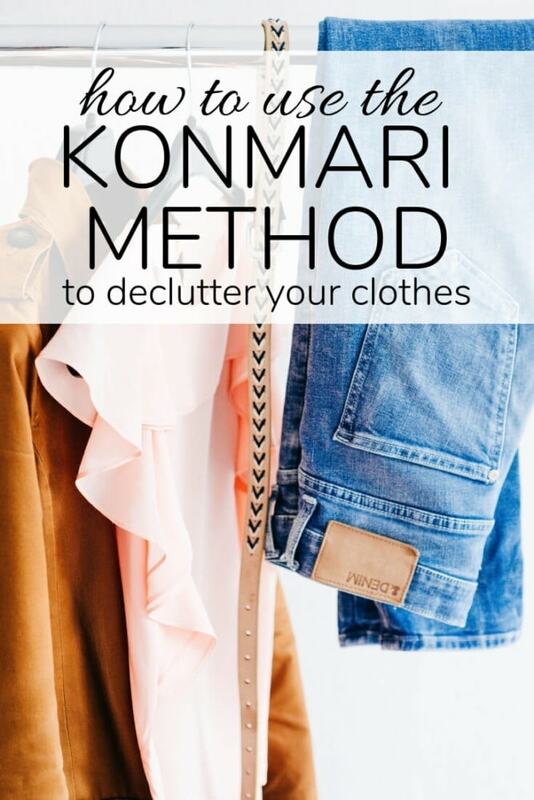 If you want to read about how this process went for me last time I went through the KonMari method, you can check out this post. As promised, I made a video to go along with this post – it’s super detailed and will give you a really good look at how I tackled this step of the process and what my strategies are. I also did a detailed tutorial on how to fold clothes using the KonMari method! I’ll cover much of it below too, but be sure to watch the video if you want to see all of the dirty details of how this journey is going so far – including what my closet looked like before! also click here to watch it on YouTube! Marie Kondo says that the first step to any decluttering venture should be to take everything you own in that category and put it all together in one spot. The benefit of this is that it’s the only way to truly see how much you have. 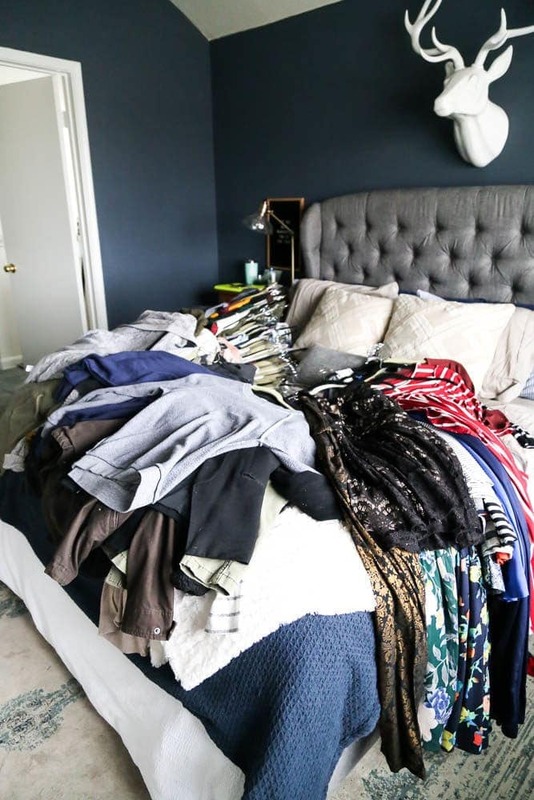 Some people have clothes spread out in multiple closets or in a few different places (like the closet and a dresser), and when it’s all spread out it’s hard to know how much is there. Once you pile it all up, you’re confronted with the sheer amount of things you own, and it’s a lot easier to know what you can get rid of. Once you’ve laid everything out on your bed, I like to make three stacks. I don’t think too hard about this step – if I have to think about a piece of clothing for more than 2-3 seconds, it goes into the “I’m not sure” stack and I move on. Now, I take everything in my “I don’t know” stack and try it on. I often need to see something on my body to know for sure if I love it. Do I feel great in this? If the answer to either question is no, it gets donated. If both questions are a resounding yes, then I keep it! Step Three: Put it All Back! Once you’ve gone through everything, you’re ready to put it back. This is where things get fun! 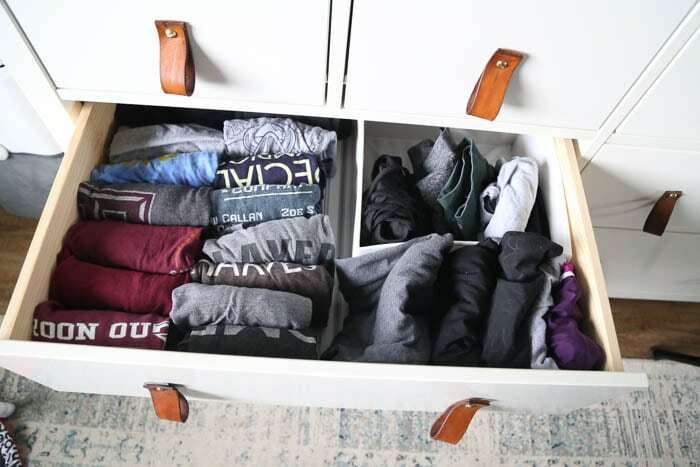 I think the way you store your clothing is a pretty personal decision – Marie Kondo prefers to store almost everything folded in drawers, but I generally prefer to hang most of my shirts. It’s up to you and what the storage situation in your home is like. All of my shirts with the exception of casual t-shirts get hung in the closet. All of my casual t-shirts (like the ones I sleep in, work out in, or mostly just wear around the house) get folded into one drawer. Now, let’s talk about folding! The KonMari method of folding clothes will change your life! Dramatic? Yes, I do have a tendency to be a bit, um, emphatic, but I can pretty much guarantee that once you perfect the KonMari folding method you’ll never go back to any other method again. Start by laying your shirt flat on the ground. Grab the sleeve and fold it back so that it lays on top of the piece you just folded. Repeat steps 2-3 with the other side. You should have a long rectangle at this point. Take the bottom hem of the shirt and fold the entire shirt in half, but leave a small gap near the top. Pants and shorts are very similar to shirts – but they’re actually a bit easier. Fold the pants (or shorts) in half. If the crotch area sticks out at all, fold it in so that you create one long rectangle. Fold the bottom hem of the pants up towards the top. Leave a small gap at the top. Fold the pants into thirds so that they can stand up. With shorts, you’ll skip step 2 and simply fold them in half. 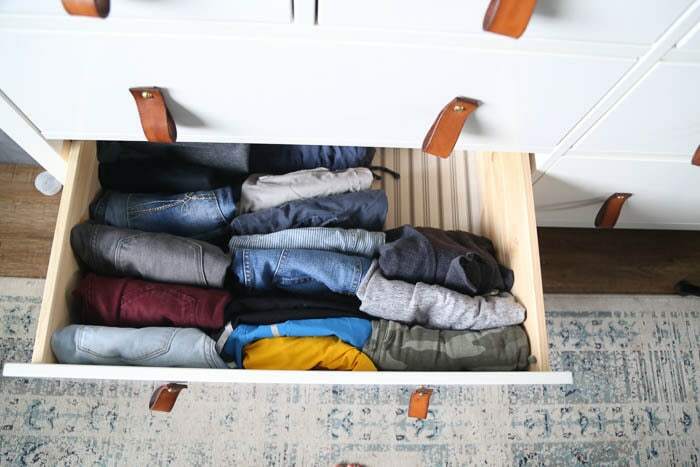 The beauty of this method is that you can clearly see everything you have, and you can easily remove one item of clothing without disturbing the rest. Plus, this folding method doesn’t seem to create wrinkles, which mean things come out of your drawers fresh and ready to wear. I asked over on Instagram if you had any questions about how to declutter and store your clothing according to the KonMari method. Here are a few of the questions I got the most often! What if I’m nursing/pregnant/just had a baby? Oh, do I ever feel you. I’m about 5 months post-partum, and this process was a bit more difficult than it was the last time around simply because nothing fits quite like it did before. Start by sorting the clothes into the three stacks I mentioned above. Even if the clothes don’t fit you at the moment, you’ll still probably have a good idea of what you love and what you don’t. Once you’ve got your stacks created, the middle stack (the “I’m not sure” one) is the where you might do things differently. If you’re at a point where you’re close to your normal weight but just have a few pounds to lose, I recommend treating this stack normally. This is where I’m at and, if I’m realistic, I probably won’t be losing the last few pounds until I’m done breastfeeding. So, I don’t want to keep anything in my closet that I don’t feel fantastic in right now. So, I tried on this middle stack as normal, got rid of anything that doesn’t fit or look great on me, and if I need to buy some more clothes once I lose the weight, I can do that. If you still have a lot of weight to lose, err on the side of keeping more. If you know that a good chunk of your closet will fit you again soon, I recommend going through that second stack one more time, a bit slower this time. If you have any reservations about getting rid of something, then keep it. You can always go through your closet again when you’re back at your normal weight! In the end, the process isn’t all that different even if you’re pregnant or newly post-partum. I think most of us are able to say at a glance what clothes in our closet we really truly love – those are the ones you should keep. If you didn’t ever wear it before you got pregnant, you probably won’t wear it after you lose the weight! What about kid’s clothing? How do you handle hand-me-downs for younger kids? Maybe this is a controversial opinion, but I’m a firm believer that kids need way more clothes than adults. Marie Kondo doesn’t actually tackle this topic in her book, but I’m of the opinion that it brings me joy to not have to do my son’s laundry every day, and that means that he needs a larger supply of clothing. Because goodness knows a 5-year-old boy can’t wear anything more than once before it needs to be washed! As I went through our clothing this week, I did do a cursory glance through his clothes. I asked Jackson if he wanted to get rid of anything, and he said that all of his clothes made him happy. So, I looked through and removed anything that was the wrong size, stained or damaged, or that I know he just never wears. As far as clothing for Grant, I’m big on saving hand-me-downs, as long as you have room for it. And, honestly, even though we don’t have a lot of storage space in our home, we still have a plethora of clothes stashed in the house just waiting for Grant to grow into them. Don’t save anything that is the wrong season. Grant was born in August and Jackson’s birthday is in January – for us, that meant that a lot of the small baby sizes really couldn’t be passed down. It gets a little easier when they get older and clothing lasts a year at a time! Don’t save anything that you didn’t really love the first time around. I’m relatively picky when it comes to my kids’ clothing, and when I’m the one choosing what they wear, I won’t grab it out of the closet if I don’t like it. So, I tend to only keep the clothing that I really liked, and that I know I’ll use regularly. Stash the clothing anywhere you can. We have ours organized by size – all of the clothes up to 12 months are in a dresser in Grant’s closet. The larger sizes are in plastic bins. Some are in the top of his closet, and some are in the garage. It’s annoying, but I remind myself that it’s only temporary! With each new size he grows into, we are able to get rid of more clothing and re-arrange things a bit. If you’re planning on having more kids and still need to save, ask yourself what the biggest priority is: is it saving money when the next kid comes, or is it have a less-cluttered house now? Neither answer is wrong, but if you want to keep a ton of clothes for a new baby and you don’t have an abundance of storage space, you’ll have to pick one! What if I don’t love a lot of my clothes, but I NEED them (for work, etc.)? 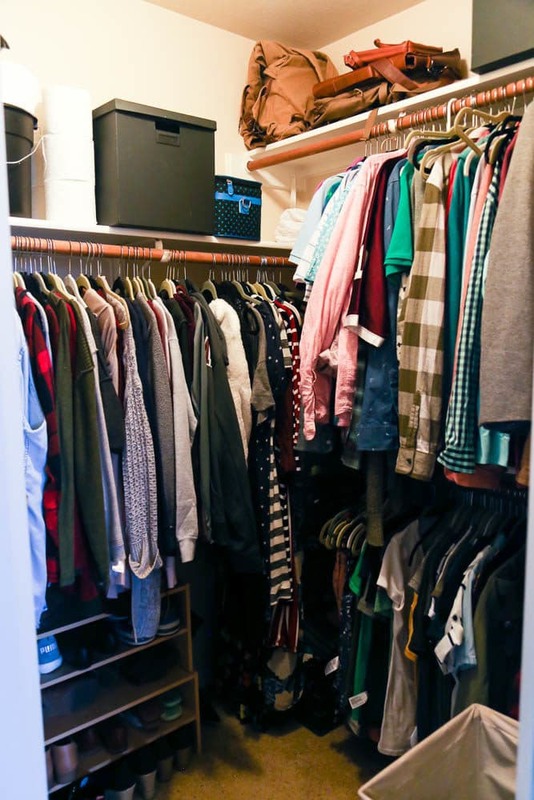 If you’ve got a lot of clothing in your closet that you don’t feel great in, but you can’t just get rid of it all because you have to wear it to work, you can still use the KonMari method! I recommend starting by figuring out how many outfits of that category you need to keep. For example, how many work outfits are the bare minimum for you? Add 1-2 to that number, and that’s how much you need to keep. For the sake of the illustration, let’s say you’d be fine with having just 5 work outfits, so you can rotate through them each week. So, add two just to be safe and your number is 7. Now, go through your work clothing and rank the outfits. Even if you don’t like any of them, start by deciding which ones you dislike the least, and rank them in order. After outfit #7, it doesn’t really matter, so you can stop ranking. Then, take the top 7 outfits and put those back in your closet. The rest can be donated. Your next step is to slowly start replacing the things in your closet that you don’t love with things that you DO. You can just buy one outfit at a time as you have room in your budget, and replace them beginning with the outfits you like the least and working up until you’ve replaced them all. Even if it takes a year or two to replace all of the clothing you don’t like, you’ve still got a selection of things to wear in the meantime! In the end, we donated a total of 2 garbage bags full of my clothing, plus we found another full garbage bag worth of trash! Corey still has to go through his side, I imagine we’ll fill up at least one more garbage bag with that. Our house is already feeling a little more organized, and I’m really excited to get started on our books! Check back next Wednesday for that post, and be sure to subscribe to our YouTube channel so you don’t miss the next video when it goes up! I applied the KonMari folding method to my 9 month old’s clothes (she addresses baby clothes in one of her Netflix episodes). My issue has been trying to find specific clothing when it’s folded so small. For example, similarly colored tops that have graphics/text on them. I find myself unfolding and refolding looking for the specific item I need. Have you encountered this as an issue? If so, any tips?